Combine all of the ingredients in the crock of a slow cooker. Cook on low for 10-12 hours, until the lentils are tender. Serve. We go meatless at least twice a week at dinnertime, and on nights like that, it’s important that dinner is filling, flavorful and nutritious. This Slow Cooker Tomato Lentil Soup hits all the right notes. We’ve barely hit the double digits of January, and the Northeast has been blanketed, covered and piled with snow. With snow banks towering on corners, and parking lots abbreviated by mountains of piled snow that seems to have no plans of melting, it’s giving new meaning to “Hey, baby, it’s cold outside.” And if there is one thing that makes you forget about the howling wind and the threat of snow, it’s a warm, comforting, meal. Soup is perfect for times like this, and no, I am not just saying that. In the depths of winter, there is simply no better meal. It warms you to the bone. Slow Cooker Tomato Lentil Soup is a chunky, filling, delicious soup perfect for chilly, icy days. 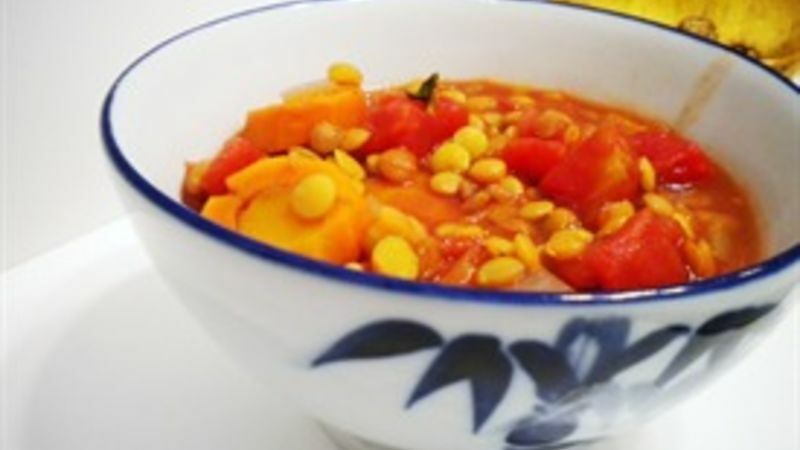 It’s filled with lycopene-rich tomatoes, beta carotene-rich carrots, and fiber-rich lentils. And it’s flavorful too (cause really, who wants to eat a flavorless soup?). Plus, with no added fat, it’s a nice dish made from whole foods. As an added bonus, this is a vegetarian soup – which makes it perfect for meatless days (or a meatless lifestyle).